Make the most of the sun with the Intex 8ft Easy Set Pool. Enjoy making a splash in your own back garden every summer with this large and easy to set up swimming pool. At a full 8 feet wide, this large above ground pool is the perfect depth for kids, and roomy enough for adults to enjoy too. It holds approximately 2,419 litres of water for hours of splashing fun. The laminated sidewalls are made of super tough material to resist wear from abrasion, impact or sunlight. The sidewalls of the Intex 8ft Easy Set Pool are made from 3 separate layers of material for extra strength and durability, allowing your family to enjoy outdoor fun for years to come. 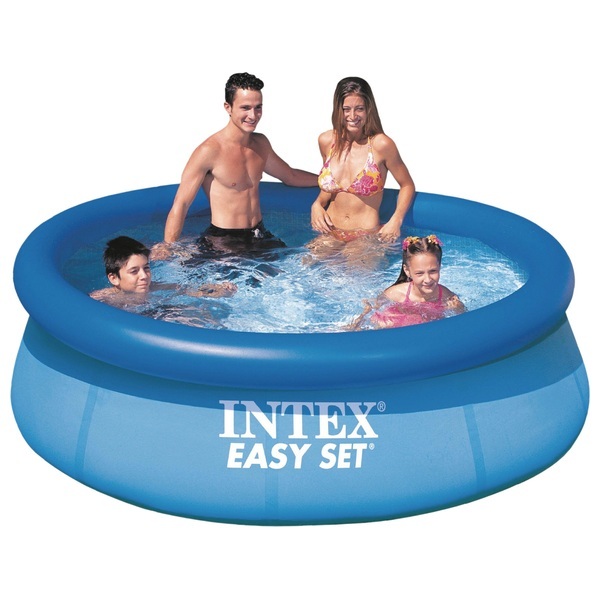 The Intex 8ft Easy Set Pool is long-wearing, easy to set up, and ready for water in 10 minutes. This could be the perfect pool for you. Quick to assemble and easy to maintain, the Intex 8ft Easy Set Pool requires no tools for assembly. This pool comes with a drain connector and 2 strainer hole plugs for easy set up and disassembly. Thedrain plug can be connected to a garden hose to drain water out of the pool. EU Warning: Not for use by children under the age of 3 years due to choking hazard. Use only under competent supervision. Read and follow enclosed owner's manual. The pool must be set up on solid level ground.